This 24dB grid antenna's construction features a die cast aluminum reflector grid for good strength and ease of installation. This antenna's 2-piece reflector grid is simple to assemble and significantly reduces shipping costs. The grid surface is UV powder coated for durability and aesthetics. The open-frame grid design minimizes wind loading. 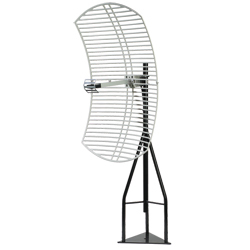 The HG2424EG antenna is supplied with a 60 degree tilt and swivel mast mount kit. This allows installation at various degrees of incline for easy alignment. It can be adjusted up or down from 0° to 60°.